Recently, we’ve been hearing a lot about knives being used in extraordinary circumstances, like the case of Aron Ralston or my recent post about doctors using a Swiss Army knife to amputate a man’s legs. These are just two examples of survival situations where a dull knife simply won’t cut it, literally and figuratively. In many survival situations, knives become dull from overuse, and there are no sharpening tools available. If you ever find yourself stranded in the wilderness, here are some things you can do to sharpen and hone your knife. Bear Grylls, the rugged star of Man Vs. Wild, often has ingenious solutions to problems and needs that occur in the wild. Knife sharpening is no exception. In one episode, Bear grinds up a rock into fine bits and places them onto a smooth piece of live wood. He then uses his creation as a whetstone and slides the blade up and down the wood. For a visual tutorial, check out Bear’s video here. Though you can use any rock to sharpen your knife, stones that are flattened by a stream work the best. 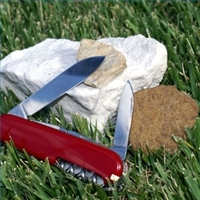 Once you’ve selected a flat rock, take the knife and gently slide the blade against the surface. Make sure to do it on both sides of the blade. For more detailed information, read this article. If you have no access to stones, simply stropping your knife on a leather belt or sheath will help realign the blade. Although stropping does not actually take any material off, it can still realign a deformed edge and remove slight indentations. For more information on how to strop a knife, take a look at this video tutorial.